And then a voice from the other side of the mass of sewing machines that filled the room – like a flotilla of yachts crowding a harbour – yelled, “Sixty-one, Walter!” correcting him. 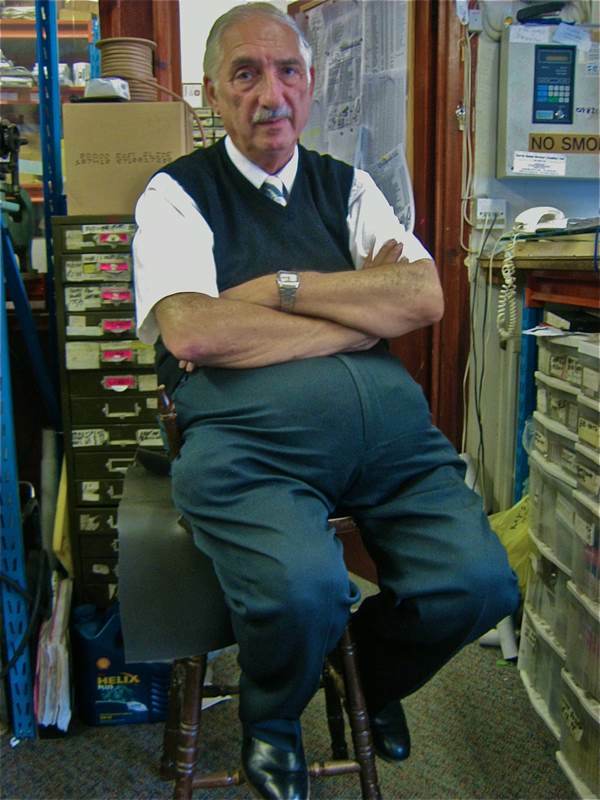 This was the voice of Alan Stroud, a sewing machine mechanic who has been around Walter, working on a self-employed basis for twenty-six years. “I’m sixty-six, I’ve been doing it over fifty years,” volunteered Alan cheerily, chipping in. 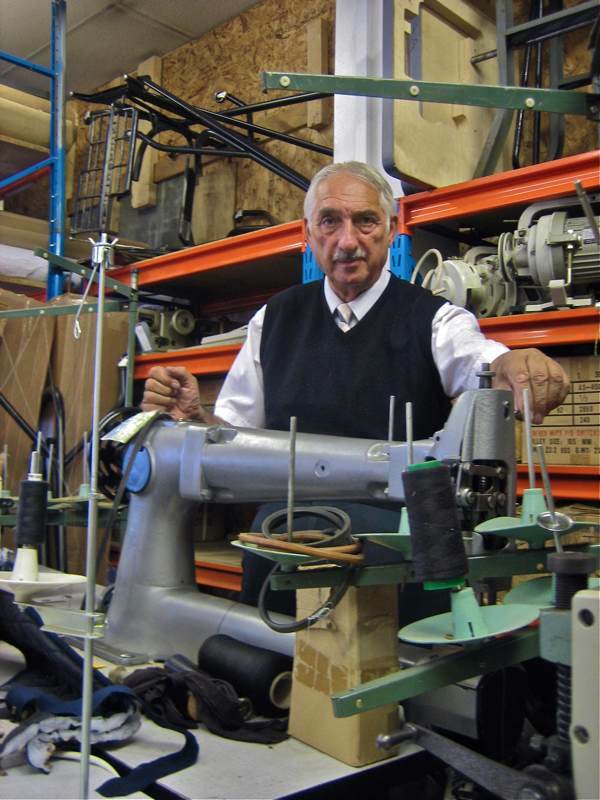 Completing the trio at Cruisevale Industrial Sewing Machine Rental in Hessel St, Stepney, was Al Jaw, driver and electrician, who has been part of the company for thirty-six years. He sat with Alan, tinkering with a sewing machine silently, not wishing to get drawn into this one. 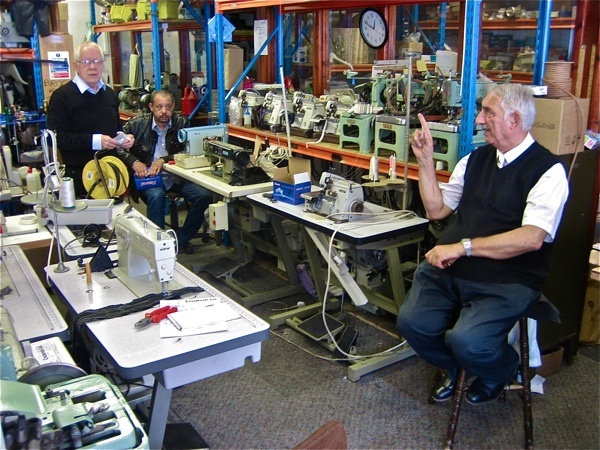 Yet in the workshop there were sewing machines of sixty and eighty years old, still in working order, sturdy and shining, and ready to go.”That one is good for another hundred years,” declared Walter with a flourish to a Reece Keyhole Buttonhole machine. “Yes, but the mechanic won’t be!” protested Alan, prompting Walter to shake his head, accepting there are some things beyond human control. 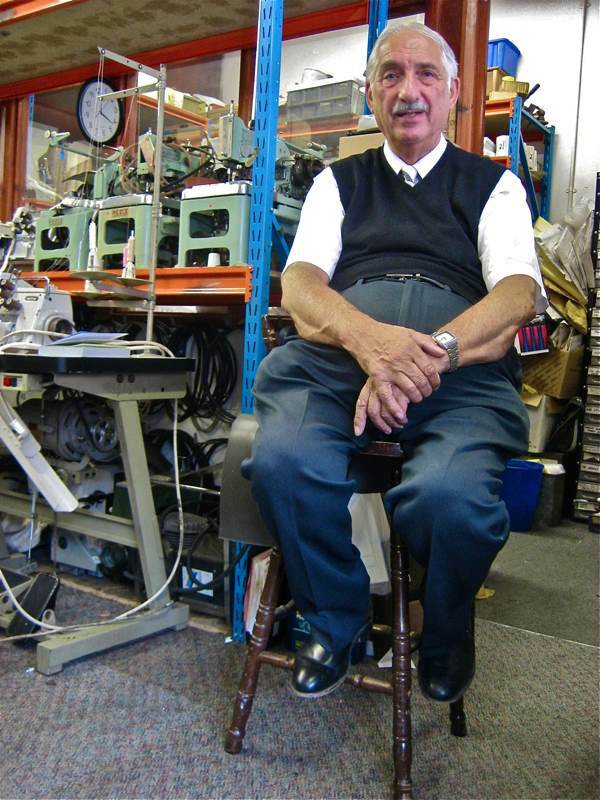 “Sewing machines have two faults,” he confessed to me, “They were made too well, so people don’t need to change them. And the costs for fixing them have always been set too low, half the price of car repairs. We’ve not followed the American way, buy it, throw it away and buy another. We’re not like that, we are used to cleaning up rusty old machines and putting them back together.” And he appeared almost apologetic of a business policy that would strike many as enlightened. “I never had a day off in thirty-nine years,” Walter announced in a dry dignified tone, “But I had my lunch paid every day, a new car every two years and all the Jewish holidays off with pay.” And then he led me into the office where he brought out cherished back copies of Sewing Machine Times for which he was once advertising manager. There were yellowed copies going back before his time to the nineteen twenties when sewing machine companies also sold mangles and prams. Then suddenly his eye fixed upon a button hole machine illustrated in one of these pre-war publications, “Look!” he cried spontaneously in wonder, “Alan come here!” And Alan rushed in, and together they delighted over the illustration of an early model that they still had in service, exchanging mutual smiles of excitement, unified by their lifelong passion for sewing machines. Walter shows off his machine for sewing tarpaulins. 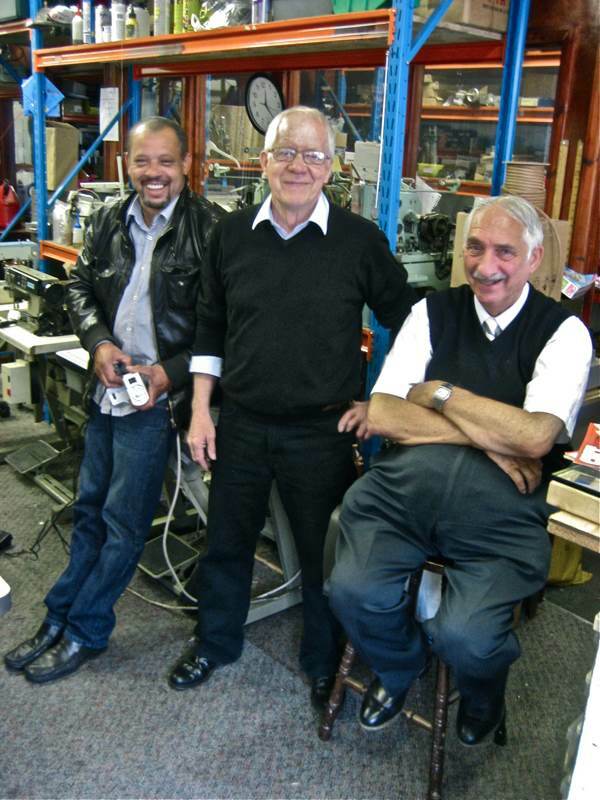 Al Jaw, Alan “the boy” Stroud & Walter Breindel of Cruisevale Industrial Sewing Machines. Greetings Walter from someone who spent his life in the Shmutter Trade. Lovely article, gentlemen. You have looked after my Model 101 machine for nearly 2 decades and it is still going strong! It’s had a colorful journey so far – from the top floor of Hardy Amies to the basement of Dege’s workshop, the back of AJ Hewitt’s and then a rest in the coal sheds under St. George’s Street before settling in my new digs here in E1. Thank you for your part in the story. “Everyone I know is dead”…. That comment made me hoot with laughter. I think you’ll find Walter, that quite a large number of people that you know, are very much alive & kicking. A fact that many of your friends and associates would be only too pleased to acknowledge. Fantastic article! 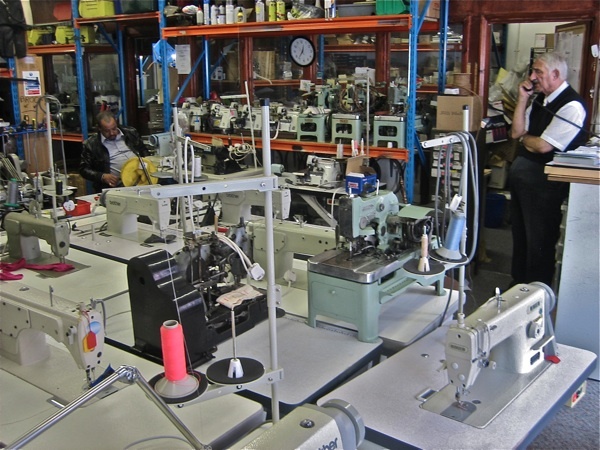 As an avid sewer myself, I feel I’m keeping their trade alive with my 5 machines (3 sewing, an overlocker and a coverstitch)! Fantastic article! We (Singer India) also the Manufacturers different type of Sewing Machines. Wonderful article. I still use the Singer zigzag machine I bought 52 years ago for $99. It sews a fine seam. A little oil and a dusting and it is ready for another 50 years.